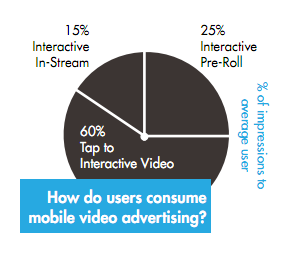 Mobile video advertising is currently a rolling tide slowly making its way to the shore. It’s no surprise to hear, considering 10 percent of mobile users watch video content on any single day. So what’s the hold up? Why aren’t brands hopping on board to advertising through mobile video? Mobile video advertising didn’t even make the 2011 Mobile Marketing Associations Top Ten Trends for 2011 — “Apps will drive advertising revenue.” But, they also state that over 85 percent of all phones shipped in 2011 will be smart phones, capable of mobile video. According to an article on Digidaydaily, the top 10 mobile handhelds sold in the U.S. “account for just 29 percent of mobile video commercial messages viewed,” and that Verizon had the most mobile marketing video views at 44 percent, compared to AT&T’s 35 percent. This would make one imply that marketers should be targeting mobile users via text, since it is much broader and marketers can deliver MMS to over 93 percent of mobile users. The groundbreaker of it all is that mobile video ads allow for direct-to-consumer advertising. Mobile video ads can be targeted based on buying and search habits, user location and certain user interests, and allow advertisers to target their target, per se, more efficiently. It seems that it won’t be long until advertisers will have real-time information about their target whom they want to view the ads, and pertinent information about the user during and after viewing the ad. You are currently browsing entries tagged with Mobile Video at Direct Message Lab.